Can I just start by saying how awesome it is that this is the third time I've been asked to review a DVD of this game for dOc? It's like my favorite movie, and it always ends the good way every time. dOc, as you may know, is heavy with Cubs fans, and though I cannot claim to feel the depths of their misery, I will say only that it was been a long, sad, lonely quarter of a century since 1986. And now that my team has been Madoffed, I don't see it getting better any time soon. It's kind of amazing that the game remains such a touchstone—Don De Lillo has written about it, and it was even the unnecessary focal point of ESPN's recent documentary on (sorry, colleagues) the Bartman game. Bill Buckner has become the poster boy for failure (though it should hardly be all on him), and this was one of the most infamous stanzas in the opera that was the pre-2004 Red Sox. (Amazingly enough, two World Series victories in four years hasn't erased the sting of this one for my Boston friends. Lighten up, Francis.) The comparisons ran rampant earlier this year with the Rangers/Cardinals Game 6, which was epic in its own way, but already seems kind of foggy, no? 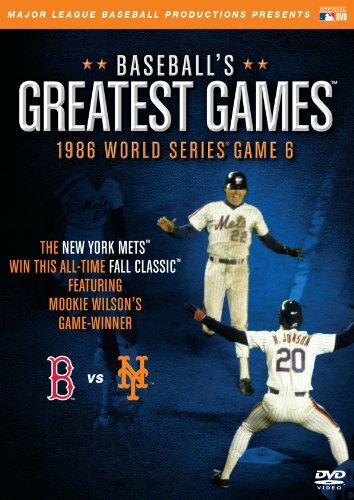 The question this DVD raises, really, is: do you truly want to watch a baseball game that was played 25 years ago, one that's already been played to death? If you don't know the game or how it concludes, well, it's hard to imagine you'd have even the most remote interest in this title. If you're a masochistic Red Sox fan (is there any other kind? ), you know where to turn; if you're a Mets fan, if your tape of the game hasn't faded yet, your VCR is probably no longer in good working order, so get this bad boy on that wish list. You can go meta looking at this, too, and see how much baseball has changed (this was pre-steroid), and how far technology has advanced—what's here looks primitive to the avalanche of games we get on ESPN and everywhere else when baseball is in season. The one thing that's kind of cool about this new release is that you get not just the original NBC broadcast, with Vin Scully doing the play by play and Joe Garagiola as his color man, but also the local New York radio broadcast—it's got odd pauses and blips where advertising content must have been cut out, and you'll think for a moment that there's something wrong with the disc or your system. There isn't, and it's a wonderful chance to hear once again the pipes of Bob Murphy. For those of us who grew up in New York listening to Mets games, Murph was the voice of baseball, the voice of summer.